Though robotic 3D printing technology is currently undergoing rapid development, most of the research and experiments are still based on a bottom up layering process. This paper addresses long term research into a robotic 3D printed polygon mesh whose struts are directly built up and joined together as rapidly generated physical wireframes. This paper presents a novel “multi-threaded” robotic extruder, as well as a technical strategy to create a “printable” polygon mesh that is collision-free during robotic operation. Compared to standard 3D printing, architectural applications demand much larger dimensions at human scale, geometrically lower resolution and faster production speed. 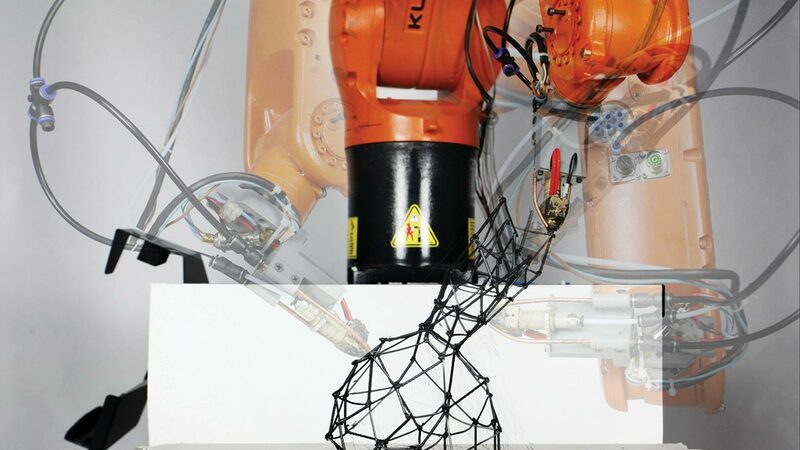 Taking these features into consideration, 3D printed frameworks have huge potential in the building industry by combining robot arm technology together with FDM 3D printing technology. Currently, this methodology of rapid prototyping could potentially be applied on pre-fabricated building components, especially ones with uniform parabolic features. Owing to the mechanical features of the robot arm, the most crucial challenge of this research is the consistency of non-stop automated control. Here, an algorithm is employed not only to predict and solve problems, but also to optimize for a highly efficient construction process in coordination of the robotic 3D printing system. Since every stroke of the wireframe contains many parameters and calculations in order to reflect its native organization and structure, this robotic 3D printing process requires processing an intensive amount of data in the back stage.